If you haven’t been to see a production at the Looking Glass Playhouse in Lebanon, IL, you are missing out. 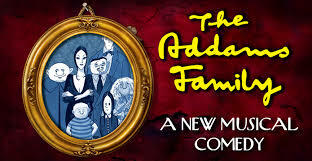 Today was my second time (my first time was to see The Diary of Anne Frank) in attendance for a viewing of The Addams Family, with the hub and my two daughters both under the age of nine. To be honest, I am not sure who laughed the loudest of the four of us. The introduction prior to performance given by Gigi Dowling Urban definitely increased our anticipation for not only today’s musical comedy, but also the entirety of the 2014-15 season if, “When can we see Mary Poppins?” uttered by a third grader is any indication. In addition, Urban’s encouraged snap along to the rhythm of the Addams Family theme song definitely evoked giggles by all. The set designed by Brad Sanker (a.k.a. Cave Man Ancester) was both eerie and alluring. Clever costuming by Peg Zuger and Jason Johnson (a.k.a. Fester Addams) not only brought the Addams family to life, but also reinforced the unique deaths of the ancestral family with allusions to such works as The Shining and Titanic. Furthermore, I cannot remember the last time my breath was taken away at the lighting design courtesy of Jason Koonce (a.k.a. Lucas Beineke) and again, Brad Sanker. Being a part of the universe amidst the moon and stars was an experience I would definitely repeat. The music, choreography, and casting was beyond exceptional. The chemistry between Gomez Addams (Russ Reidelberger) and Morticia Addams (Leigh Reidelberger) was undeniable; I could have watched them tango all evening. Grandma Addams was hysterical with her delivery especially in regards to her take on texting versus reading, and Uncle Fester took me back in time as I used to watch The Addams Family on television as a child. Bravo! Again, my only complaint is the lack of biographies found in the program. I would love to read more about those who were involved in such a production.